Word cloud created by the author at http://www.wordle.net/ and comprised of keywords for coding user-generated Foursquare tips. While not a construction per se, there were also instances in which the entire tip was simply a naming of an item; only suggesting that it was enjoyable and worthy of sampling (e.g., “Honey vanilla latte!” ). This construction was reworked any number of ways. Sometimes the writer would insert a command, insisting that the reader also get said consumable. In other cases the writer imposed grammar (an article and a verb) to communicate a more refined recommendation. Naturally, examples of refined commands presented. Furthermore, commands varied (i.e., go, get, try, and have). 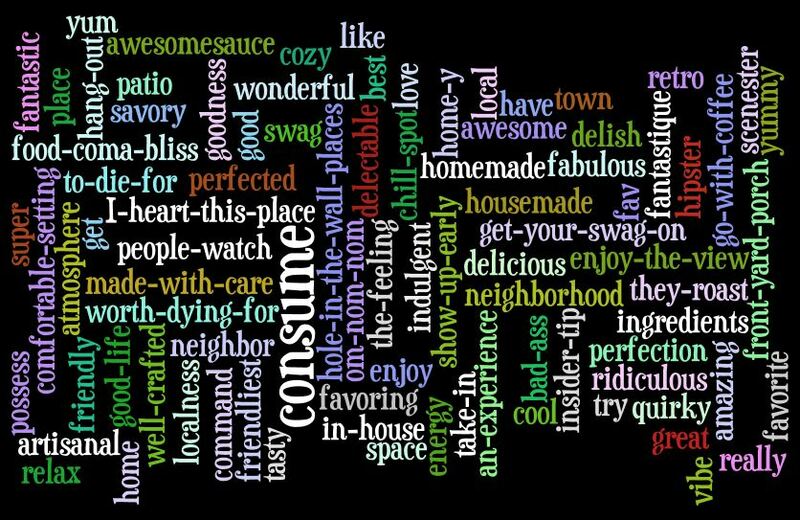 Carefully selected words, such as “indulgent” and “savory” made otherwise common tips stand out from others. However, some of the first word “gems” that got my attention were invented, emergent, or otherwise modified words, such as: awesomesauce (awesome), delish (delicious), fav (favorite), food coma bliss (satisfying), and my personal favorite — an example of onomatopoeia — om nom nom (presumably the sound of one eating with reckless abandon somewhat like Cookie Monster). Urban Dictionary is a serious and entertaining lexicon that crowdsources definitions for emergent words, including awesomsauce. Here we have the current high-vote definition for awesomsauce. Not surprisingly, I began to notice tips that I would characterize as “insider information” for those who are “inside” the Foursquare network. This can include references to the “mayorship” of any given venue, but also details that may not be readily apparent from the first few visits, such as wi-fi codes, items not listed on the menu, understated practices, or skillful employees that don’t otherwise standout from their peers. With these observations, some questions began to percolate in my mind and I returned to the data set with the intention of developing a list of keywords to look for in order to identify more complex constructions and uncover common linguistic practices. Naturally, I was also curious to see if any of these qualities lent themselves to more Likes/votes than others and if there were any curious variations among the different coffeehouses. 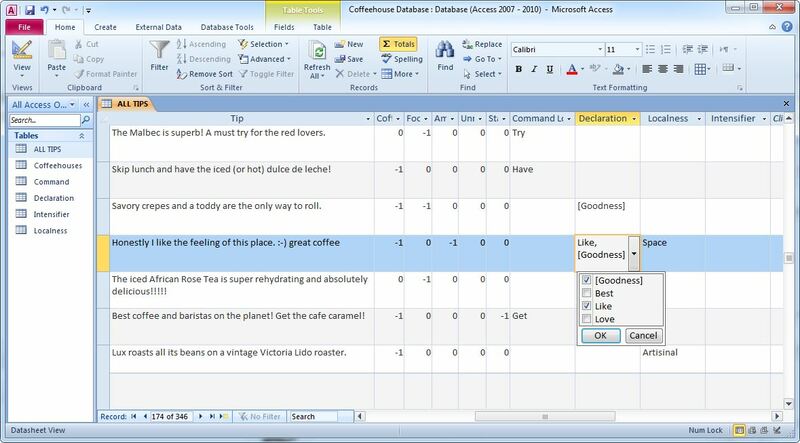 I created a database “score card” using Microsoft Access that allowed me to set up columns containing multiple keywords. The result is that I would be able to filter tips for individual and collective keywords. This process came to resemble the method referred to in “The Coding Manual for Qualitative Researchers;” specifically, the three-column approach promoted by Liamputtong and Ezzy to render “code jottings” into established code categories. After reviewing the tips and making notations numerous times, I settled on the following codes and identified the keywords that counted for them. This entry was posted in Reflections and tagged Foursquare Coffeehouse Mini-Ethnography. Bookmark the permalink.